Daniel Palmer: How long have you been a curator of photography? Susan van Wyk: Since 1989 – almost twenty-five years. DP: And how did you come to photography? SvW: I studied photography at art school, and then a couple of years after I finished that I did a postgraduate in museum studies. Then, about six weeks after I finished my course, there was an ad in the paper, in the way that jobs were advertised back then, for an Assistant Curator in the photography department here. So it was kind of a perfect moment where I had an undergraduate degree majoring in photography and curatorial studies, and I got the job. DP: Did you continue practicing as a photographer? SvW: No, I’d already stopped by then. DP: In the twenty-five years that you’ve been at the one institution, what do you think are some of the main changes that you’ve seen in the field of photography? SvW: When I began, photography was very much on the sidelines. It was like it was happening on some branch-line somewhere. There were people who were engaged with it and there was a history of photography and there were photography shows, but it never felt like it was part of a broader practice in some ways. Particularly within this institution, photography was treated as quite a separate thing and was initially on the outer, and that’s completely changed over twenty-five years. So there’s a much broader-based engagement with photography within this institution. There’s an expectation that you’ll see photography shows, and that photography shows are an important part of the contemporary art program. That’s a given now, whereas in the beginning it wasn’t at all. Looking at shows over many years, there seems to me to have been that shift more broadly as well. There is an engagement with photography in such a way that you don’t need to have the conversation about why it’s in a gallery anymore, be that in a public institution like this or an artist-run space or a commercial gallery. That debate seems to me, largely, to have died the death it should have. DP: Do you think that shift is largely a reflection of what’s happened outside the institution, the way that artists work with photography? DP: How does this influence the relationship between the department of photography and the department of contemporary art? SvW: There’s an increased dialogue and there’s far greater crossover, which comes into play in the exhibition schedule and also in the acquisition realm. For instance, we recently purchased a work by Sophie Calle. The work lives in the photography collection – in terms of where the funds came from – and this is the collection storage area it’s in, but I don’t think that anyone in the institution sees a work like that as being exclusively in the domain of photography. It’s a key contemporary artwork, and that kind of openness and exchange is a given now. DP: There must be occasions where it’s not so simple? SvW: There are, and there are occasions where I’m perhaps driven more by a sense of a history of photography. At other times, things that are discussed in relation to contemporary art more broadly, and they’re quite different to the things that discuss or illustrate a similar concept that I would have chosen, because I’m coming from a quite particular background, quite a particular history. So while I say that it’s more inclusive and it’s broader, it’s not always simple. Personally, I think it is important to recognise that photography has a history, and because our collection has a historical base, it’s important that we collect, reflect and exhibit that material as well. DP: I’m sure you would agree that photography has multiple histories? SvW: Yes, it does have multiple histories, some which have always been in a realm deemed appropriate for an art institution. But there are whole other areas of practice which have traditionally been outside that realm, which are now being engaged with far more. DP: On that point, one what basis do photographs enter the collection here? What kind of criteria do you apply, in terms of acquisitions? SvW: Well, we have a collection policy document. DP: Is that a public document? SvW: No, it’s not. Each department has one, but they exist as a single document, so that each department has a chapter, to build up that picture of what our collecting priorities are at the moment. That’s often driven by the exhibition schedule, areas of the collection which have been recognised in need of expansion and growth, reflecting sometimes a collection area that’s been identified. At other times it’s about filling in gaps in the existing collection, so they’re really the things that drive it, and sometimes there might be new research in an area that’s come up – not necessarily internally. For instance, there could be interesting research that’s published and opens up a whole new area of enquiry, as it were. So the collection priorities change over time. It’s not a fixed document. It’s reviewed annually, because of course ideally, if you’ve got this list of aspirational acquisitions, over the course of twelve months you’re going to achieve some of them, those things will be done and having done that, what does that then mean in terms of collecting, or has that lead you down another path? So it’s very much a living document that things refer back to, and our acquisition submissions now have to refer specifically to the collection policy document. For example, recently, probably five or six years ago now, contemporary Chinese photography was identified as an area that we didn’t hold at all, and an area where there had been at least ten years of activity that we didn’t represent. So that was identified as a collecting area, and over a period of about three or four years a group of about thirty works were selectively acquired, to enable us to represent a moment in time, as it were. DP: Does the NGV aspire to be encyclopaedic – is that kind of ambition expressed in the policy document? SvW: No. Well, it kind of does, but no, because it’s an unattainable goal, you can’t do it. DP: The establishing documents of NGV were about establishing a tradition, and also about explicitly identifying different types of photography, such as forms of professional which I suspect are now not so much on the agenda. Why do you think this interest in broader fields of photography has tended to drop away in favour of a more conventional art museum narrative of photography? SvW: I suspect it has something to do with the very strong collecting traditions of photography within libraries, which seek to categorise things in different ways. Also, generic categories are often artificial and limiting, even nonsensical. They seem to be premised on the idea that there’s one way of looking at something, when in fact as you said before just as there are multiple histories of photography there are often multiple histories of single works. I suspect it’s that, in part, and I suspect it also has something to do with the origin of photography being included in the art museum, included, but being seeing as different, being seen as something other. DP: As you know very well, a lot of the Australian photography in the NGV’s collection made prior to the rise of ‘art photography’ in the 1970s was not originally made as art. It was made in all sorts of different fields, some of which has belatedly become part of a narrative of art photography. Since the 1970s, are there any work that you can think of in the NGV’s collection that were not made by an artist as ‘art’? In other words, is there any vernacular work from the contemporary period? SvW: Our collecting has moved very strongly into that realm of collecting art photography, say as distinct from commercial photography, or library collections that are subject driven. I think we have clearly positioned ourselves differently, and defined ourselves in a different way. But we still deal with commercial photography on occasion. Take the Edward Steichen show that’s on at the moment. Here is someone who is clearly regarded as a major figure in the twentieth century in the history of art photography, but we have an exhibition on display that’s got nothing to do with his artistic practice at all – it’s his commercial work that was disregarded as having artistic merit for a long time, which has now assumed a completely different status and is approached completely differently. DP: Perhaps over time, commercial and other non-art photography being produced today may be revalued? SvW: Yes, I wonder about that – the whole realm of fashion photography, for instance, seems to me to be completely open to that. DP: You’ve spoken about the library and the different emphasis of the art museum. One way of thinking about this is to do with the art museum’s interest in the art object, as opposed to a mere image. What kind of dialogue do you have with the State Library of Victoria, do you think about what they’re collecting, or do you operate autonomously? SvW: On the whole we operate more autonomously. The area where we probably intersect or overlap in terms of collecting is in nineteenth century Australian work. Anything twentieth century or later we really are driven by quite different imperatives. I think that’s a reflection of the dominance of commercial photographic production in this country in the nineteenth century. DP: Arguably photography’s never been as popular in galleries as it is today. Do you have any thoughts about why this may be the case? SvW: I expect that it’s associated with the crazy increase in the number of photographic images we all produce and consume everyday. DP: But that could work the other way, couldn’t it? Why do you think it might lead to an interest in photography in galleries? SvW: I think it’s because if you start to look at a whole lot of images online and in a whole range of other ways, every now and again you’re going to come across a historical image. I think this opens up the fact that there are collections in art museums to an audience who is actively engaged with photography as part of everyday life. I think about my teenage children who produce and consume photographs, hours every day, and their friends who come across things occasionally. I think part of that fascination is just to do with an increasing literacy – well, it’s not really a literacy with photography – but an increasing familiarity with photographs that people now make for a whole range of purposes. DP: As you’ve just suggested, photography’s presence outside the museum is largely felt onscreen. Culturally that’s were the photograph now primarily exists. How do you think this might start to influence the way we think about photography ‘on the walls’? SvW: It’s a really interesting question, because we’re perhaps at a moment that’s not dissimilar to the point where publishing is at. We’re in a period of change between one format and another. While I can’t see that the printed book is going to disappear, it’s not the only way that we read things or look for things, or aspire to publish things anymore, and I think photography is in a similar position. What that means for an institution like ours, with the kind of collecting history that we have, and the kind of collecting policy we have, remains to be seen. I think there are going to be changes in the not too distant future, simply because we have to engage with that whole arena of artists working without producing something that you put in a frame on the wall. There is a whole raft of practice out there that fits in that realm and we haven’t collected any of it at this point. But it’s absolutely something that we have to be thinking about and we have to work out ways in which we can. How to show it is not so hard, but how to collect it and how to preserve it is much harder. I mean, if you look at the history of video art, it’s not made on ‘video’ anymore – the physical materiality changes and the possibility to view it disappears. Things become arcane really, really quickly. That will happen for us as well when we start collecting in these areas. So those issues about how do we deal with those things as objects is important, and how do we deal with making an acquisition. It’s very easy to justify spending ‘x’ dollars on a Thomas Demand photograph because there it is, you have it, it’s an edition of five, it’s a concrete thing. But when it becomes more ephemeral, ethereal, that gets harder. Which is just about a mind-shift, in terms of what we think it is. DP: You do show work without necessarily acquiring it, though? SvW: Yes we do, we often show works that aren’t in the collection and won’t be in the collection. DP: You imply that it’s easy enough to show digital work – can you think of successful examples of this kind of work being exhibited? SvW: Well not in a way that doesn’t look like a museum has simply stuck a screen on the wall, which may or may not be how it should be seen! But that’s the option that we have. DP: What about the NGV’s website? At the moment it’s only a promotional vehicle, but could that be a space for exhibition? SvW: Yes absolutely, there is arguably a place for an online gallery. DP: If photography is so embedded in contemporary art, one could also ask: do we still need a photography department? SvW: Well I think we need it for the same reasons that we need collections of painting or any other medium. While I’ve said we’re not an encyclopaedic collection, we do take a pretty linear approach to thingshere, and I think the more specific collections enable quite detailed collecting and focussing on areas outside the general realm, outside painting, for instance. In Melbourne Now (held over summer 2013-14) there are 400 artists, but less than thirty people working with photomedia. I think that a medium-specific department can focus more closely on an area that has less prominence. I’m sure there’d be more than thirty painters in the show, so why one over the other? Which is not trying to pick apart Melbourne Now or be critical of the curatorial rationale behind it, but it just seems to me that, as photography curators, we are bringing some people to the table that the contemporary art department had not thought about or were not aware of (in the same way that other departments are bringing people to the table that I’m not necessarily aware of). DP: The first curator of photography at the NGV, Jennie Boddington, struggled for a dedicated space to show photographs. However, your previous photography space at NGV International, small as it was, is now a contemporary art space. SvW: The photography collection will now be shown in integrated hangs, as part of the permanent collection displays. I think there are great advantages to having the ability to be part of an integrated hang. Photography is only disadvantaged in the sense that it starts in 1839, so it doesn’t cover as many rooms in the museum as painting, for example! DP: Photography has operated in an important way in the NGV colonial Australian art collection, with the introduction of contemporary Indigenous works like Brook Andrew. When you talk about integration, is it intended to be in this kind of disruptive mode? SvW: Not always, no. If you go to the gallery downstairs that’s showing 1930s work, there’s a wall of Surrealist works, and that includes sculpture, film, photography, painting and drawing – a real mixture of things. So when you show things in that fully integrated way, it’s a meaningful integration, not just using photographs to illustrate the landscape that Claude Lorrain painted, or whatever. That’s just didactic and not very interesting, to my way of thinking. When they are meaningful integrations it’s great, it’s really good. Alternatively, the advantage of having a dedicated gallery is that you can do focused shows, based on your collection. DP: Will you still be able to do those kinds of shows? SvW: Yes, but without a dedicated space. So it’s not like it has been in the past, where the photography department would program its year, with two or three collection-based shows in a particular space, as a given. Now it’s about putting forward proposals for the suite of spaces that are available for collection-based shows. It’s not just photography where that this change has occurred, it’s also prints and drawings, and fashion and textiles as well. All of the ‘light-sensitive departments’! So all of us are putting forward exhibition ideas and feeding them into an exhibition schedule. So it’s quite a different model, and I think there are advantages and disadvantages to both. DP: Given that the NGV doesn’t have a moving image or film department, how does the photography department approach the moving image? SvW: We don’t in a systematic way. However, again referring to Melbourne Now, Clare Rae has a stop-motion film and a series of still photographs on display in the show. Someone like that raises the question of where the work fits, within this traditional framework that we’ve got. If we were buying things from Clare, do her photographs come into this department and the moving image work into the contemporary art department? Or would we determine that because it’s a stop-motion moving image, based on still photographic images, that it belongs in photography? As you can see, it starts to become a bit silly, really. It ultimately doesn’t really matter – if it’s a good work, you want to get it in the collection. 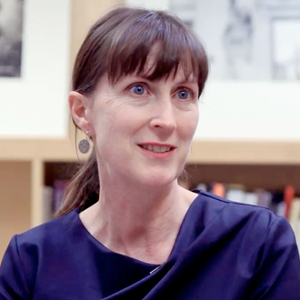 Susan van Wyk is the Senior Curator of Photography at the National Gallery of Victoria, Melbourne. Since joining the NGV in 1989 as an Assistant Curator, she has curated numerous exhibitions of Australian and international photography. Recent exhibitions include: Alex Prager (2014), Edward Steichen and Art Deco Fashion (2013), Thomas Demand (2012), Confounding: Contemporary Photography (2012), Deep Water: Photographs 1860–2000 (2011), Luminous Cities: Photographs of the Built Environment (2010), and 291: Photographers in the Circle of Alfred Stieglitz (2008). Susan is the author of No Standing Only Dancing: Photographs by Rennie Ellis (2008), The Paris End: Photography Fashion and Glamour (2006), and co-author of Second Sight: Australian Photography in the Collection of the National Gallery of Victoria (with Isobel Crombie, 2003).